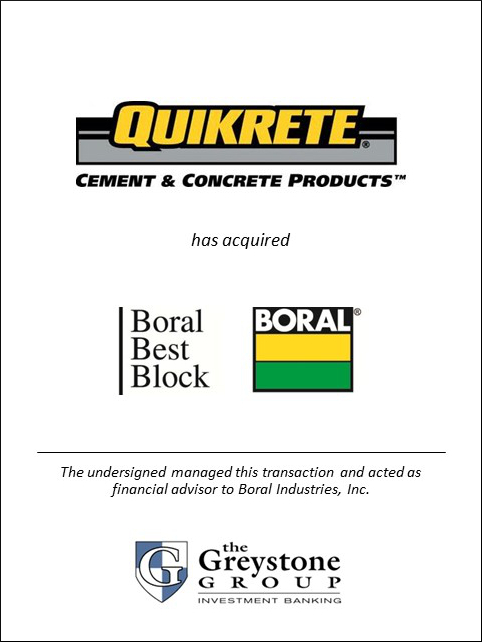 SAN DIEGO (June 29, 2012) – The Greystone Group announced today that it served as exclusive financial advisor to Boral Industries Inc. in the sale of its Boral Best Block Division to The Quikrete Companies, Inc. Boral Best Block is a leading manufacturer of concrete block along Colorado’s Front Range. With two automated concrete block facilities in Denver and Pueblo, Colorado, the company offers structural building solutions through quality architectural concrete block, Keystone® retaining walls, pavers, cultured stone and other masonry products. Boral is a leading supplier of brick, roof tile and manufactured stone veneer for residential and commercial construction in the United States. Boral is also one of the largest fly ash distributors in the U.S. and operates a significant aggregate and ready mix business in in the Denver, Colorado market. Boral Industries is the U.S. subsidiary of Boral Ltd, an international building and construction materials group headquartered in Sydney, Australia. Boral has leading market positions in cement and construction materials in Australia; plasterboard in Australia and Asia; and cladding and roof tiles in the United States. The QUIKRETE® Companies is the largest manufacturer of packaged concrete and cement mixes in the U.S. and Canada, and an innovative leader in the commercial building and home improvement industries. In addition, QUIKRETE® offers related products through numerous wholly-owned subsidiaries including SPECMIX®, Pavestone®, Custom Building Products®, Target Technologies®, Daubois® and QPR®. Collectively, QUIKRETE® products are manufactured and distributed from more than 100 facilities in the U.S., Canada, Puerto Rico and South America.